In late 1948/early 1949 the Mutual Plywood Corporation built a new plywood plant at Fairhaven on the Samoa Penninsula, west of Eureka, California. The facility had its own in-plant switching railroad, using at least two locomotives for power. One was a Davenport gas mechanical four wheel switcher, originally built in 1941 for the U.S. Army Corps of Engineers. The second started life as a 2-truck Heisler type steam locomotive, originally built in 1927 for the Elk River Mill & Lumber Company southeast of Eureka. 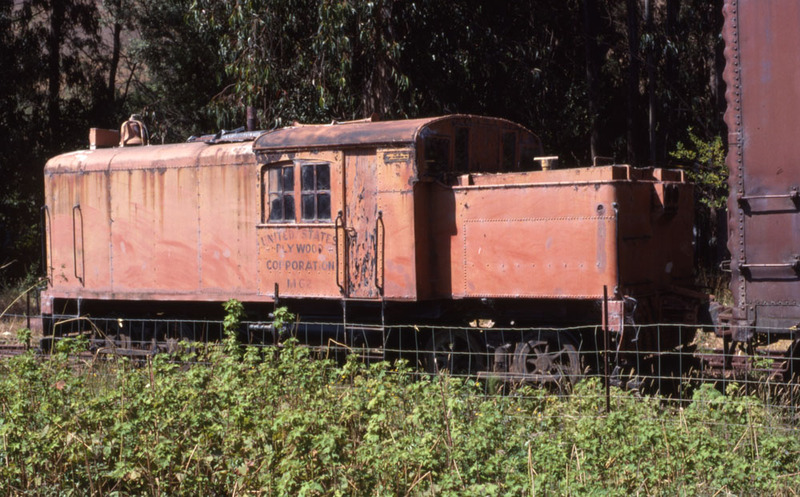 The Heisler operated there until the the ERM&L closed in 1937, then remained in storage in the old townsite of Falk until 1952, when scrappers stripped it down to the frame. Mutual Plywood purchased the remains, installed a Murphy diesel, and built a new cab and shell out of steel and plywood. The contraption entered service as Mutual Plywood #1954, perhaps for the year it was placed in service, later shortened to just #54. U.S. Plywood purchased Mutual Plywood in the early 1960s. The company repainted the two diesels, renumbering the #54 to M-62 in the process. U.S. Plywood elected to make the switching railroad an arm of the McCloud River Railroad shortly after purchasing that company. The arrangement did not last long enough for either of the locomotives to receive MR lettering, as USP shortly thereafter contracted the plant switching out to the connecting Northwestern Pacific Railroad. McCloud River continued maintaining the tracks in the plant, however, sending section crews to the coast as needed. At least one McCloud employee remembered the plant used peeler cores as ties. By 1965 U.S. Plywood decided to get out of the redwood region, and it sold the Fairhaven plant to Simpson Timber Company as part of a larger series of mutually benefitial transactions. Simpson operated the Fairhaven plant until 1981, which log shortages and market conditions forced its closure. 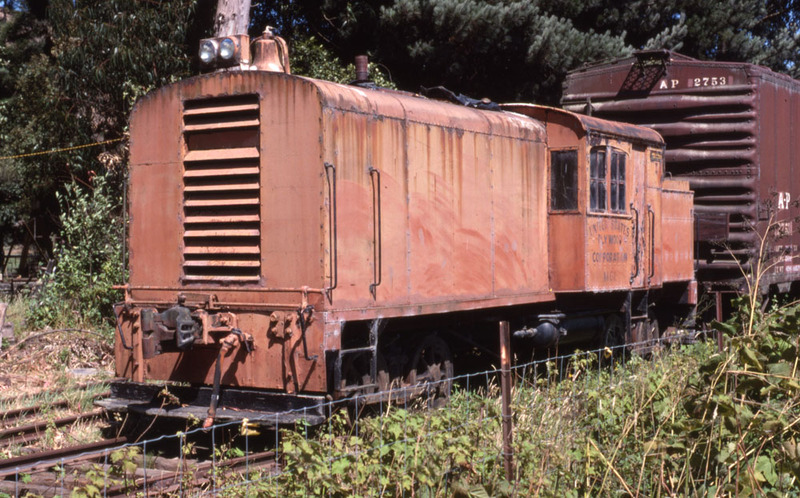 Both of the switchers used in the operation are still in existence; the Davenport passed through private ownership before ending up in the Roots of Motive Power collection in Willits, California, while Frank Bayliss bought the M-62 for display at his Alton & Pacific tourist railroad in Alton, California. Northern Counties Logging Interpretive Association, now the Timber Heritage Association, purchased the M-62 from Frank after the A&P closed, and it has been in stored with the rest of the organization's collection since, currently at the old Hammond Lumber/Georgia Pacific shops in Samoa, not far from the site of the old Mutual plant. 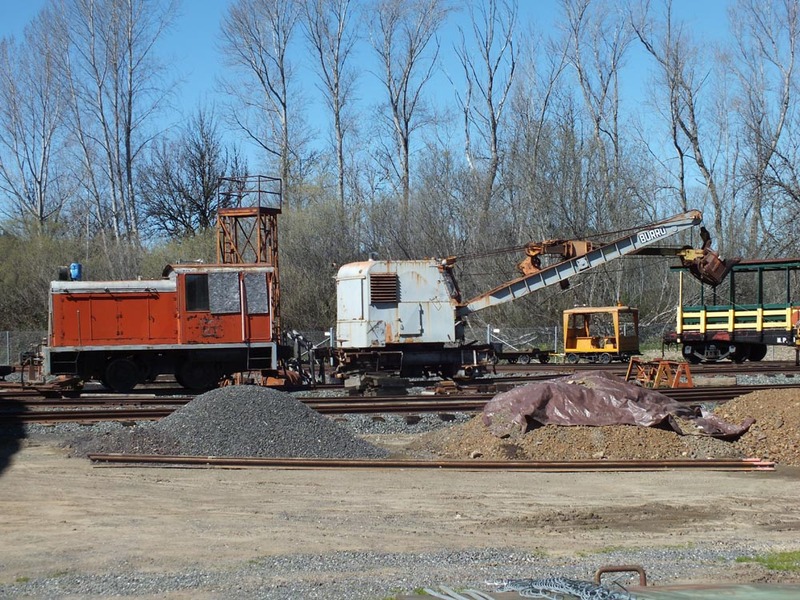 The former U.S. Plywood Davenport switcher coupled to a Burro Crane at Roots of Motive Power. Jeff Moore photo. Two views of the M-62 on display at the Alton & Pacific in the middle 1980s. Lee F. Hower photos. Links to other websites of interest. Pages will open in a new window. Mutual Plywood mill under construction- Schuster aerial photograph taken 30 December 1948, in the Humboldt State University library collection. Timber Heritage Association Locomotives- Scroll down to Mutual Plywood #54 for earlier pictures of the M-62.